The question of the true nature of the human ‘I’ or individuality is one of the key issues of our time, but it is also one of the most complex riddles of existence. 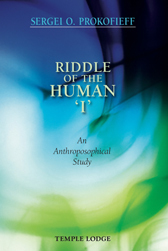 This booklet doesn’t give simple answers but adds perspectives that deepen the theme, offering a picture of its manifold mysteries. In three great panoramas, the author develops central aspects of the topic, beginning with the threefold nature of human individuality, followed by an illumination of the cosmic dimension of the ego, and finally an encapsulation of the significance of the earthly ego. With his usual thoroughness and clarity, Sergei O. Prokofieff throws light on one of the fundamental questions of our time. SERGEI O. PROKOFIEFF (1954–2014) studied Fine Arts and Painting at the Moscow School of Art. He encountered the work of Rudolf Steiner in his youth and soon decided to devote his life to it. He became active as an author and lecturer in 1982 and helped found the Anthroposophical Society in his native Russia in 1991. In Easter 2001 he was appointed as a member of the Executive Council of the General Anthroposophical Society in Dornach, Switzerland, on which he served until his death. A popular speaker, he wrote numerous books and articles that are available today in many languages.